Every marriage has issues, struggles, and problems. Nearly half of those marriages will not find a way through the problems. Those marriages fail. Not because of the issues, but for lack of solving the issues. A Marriage Fail Point is the spot where a marriage is most likely to fail, where a couple must choose a path. Either find a way to deal with the problems or fail. Interestingly, these “fail points” have only a limited number of causes. By identifying and understanding the fail points, you can save your marriage. Not just save it, but turn your marriage into one you and your spouse will treasure and protect. 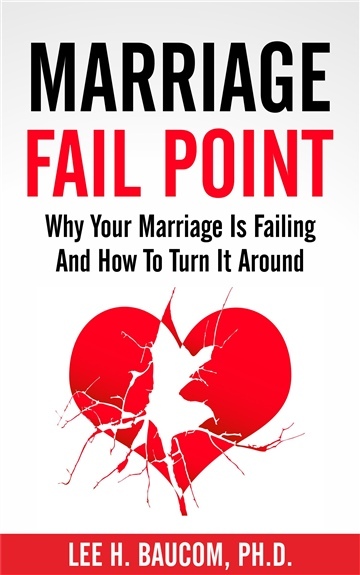 Discover the Marriage Fail Points before they cause your marriage to fail. Why marriages get into trouble. How marriages move through the Arc of Disconnection. How to start recovering your marriage. How to access resources in your efforts to save your marriage. Relationship expert, Lee H. Baucom, Ph.D., delivers the information you need, directly and briefly. Discover what readers around the world have discovered with Dr. Baucom's help. Your marriage can be saved. The starting point is understanding what went wrong, why it went wrong, and how to start turning it around. Use this brief guide as the starting point for a new marriage -- with your same spouse -- that will last a lifetime.